I am working on a project where the videographer shot and provided really high quality video files. The file sizes are huge. They load fine into Storyline and look crisp and clear when previewing. Upon publish there is such a noticeable degradation of the quality (due to compression I'm sure) that the videographer is extremely disappointed. Here is a link to an example of two identical videos of different file types. These were published using Storyline's highest quality setting. Can anyone tell me if there is anything I can do to improve the quality of these videos, or is this as good as it gets? Thanks for posting the video comparison (looks like it was filmed in Tucson - Go 'Cats!). Typically, Storyline seems to produce the best results with MP4 and AVI, and the quality shouldn't be reduced drastically. Have you tried converting it to any different types besides the ones in your demo to see if it makes a difference? 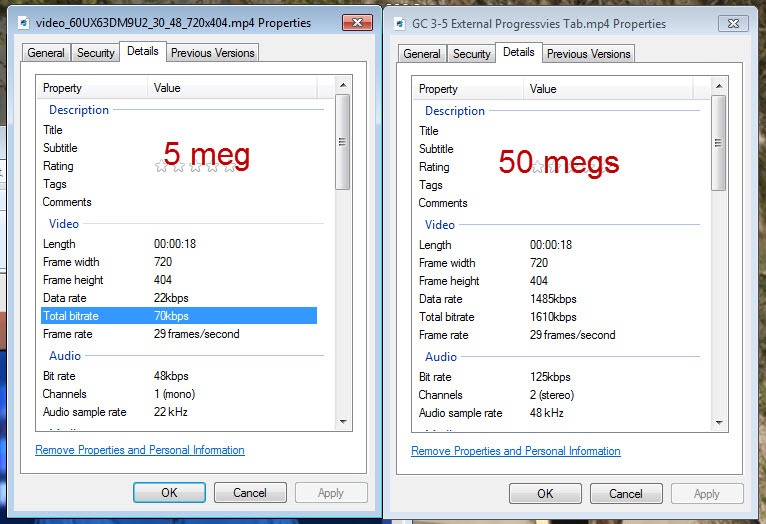 I've tried both .mov and .mp4 (those are the two types in my example. I'll try .avi and post again if I'm still having issues. Thanks! This was filmed in Phoenix - (go Sun Devils!) - just an hour away from Tucson. I just found out that these were filmed in HD - is this part of the problem? Hmm, HD videos might affect the initial load time of the course, but I really don't think it should affect the quality of the videos so drastically. Any chance you can open a ticket on this and possibly let us take a closer look at the video(s)? Some degradation is to be expected during the publish process, and I believe it will be exacerbated if the original video is larger (in terms of dimensions) than your published story size. Can you share any more information about the details of the video? Nice solution, Jorge. Thanks for sharing! I am having the same problem. My video is beautiful in preview mode and really poor once published. I like Jorge's suggested fix, but that won't work for me as I am publishing to Articulate Online and don't have a way to access/replace the source files like this. I did not resize this video as it was published to the right res for this slide (704x395). I published to mp4 using Camtasia Studio. Another thing you may want to check, if you haven't already, is the publish quality settings for videos. Very disappointed with what Articulate does to video. 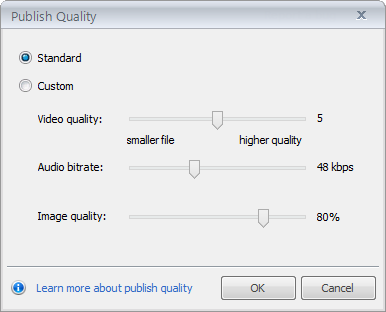 Even at the " High video quality" setting the video is severely compressed , video , data and audo bit rate are reduced way too much. As you can see in this image, the total bitrate for the original video is 1,610 , after articulate publishes it has dropped to 70 ! I understand I can replace the mp4 files in the published folder with the original mp4 files, but when you have a dozen or so video files in your storyline project it becomes way more labor intensive than it needs to be. Are there any plans to fix this ? Hi John, welcome to the community. I think a feature to include a "compress or don't compress" option would be great. Please feel free to share you thoughts directly with our development team. In the meantime, if you decide to go the route of replacing the published videos with the originals, I've outlined the process here. I have submitted an enhancement request as well for a " Don't recompress video" option on publishing. Thanks for the recomendation Peter ! Thanks for the feedback, John! We really appreciate it.